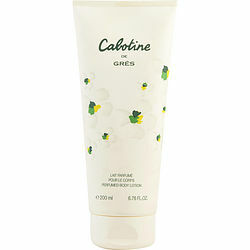 Cabotine body lotion is the best. It kept my skin from getting dry from the bitter cold outside and leaves a very subtle but pleasant fragrance. I haven't met anyone who disliked it at all so I'll be getting the perfume and shower gel to layer it with. Cabotine--I Love this perfume;especially as a summer fragrance. However i am disappointed that I can no longer obtain their spray deodorant--It was the best!!! Because of the subtle scent of Cabotine it is an excellent fragrance to layer - e.g. body wash, body lotion and perfume. For the same reason, the subtleness, Cabotine suits all ages, particularly the summer people, those with fair skin. Cabotine was a gift to me 30 years ago. I loved it and it loved me. People always comment on the 'lovely smell'. Then for a long time, I was unable to source supplies and was so glad to discover the Fragrance Net has it in stock. Once again, people are saying "Oooh, you smell lovely!" Just wish there was a Cabotine Talc.